Megaflo is an effective subsurface drainage for the removal of excess water from the aggregate layers within road and rail formations, from behind retaining walls or in sportsfields. Megaflo has twice the inflow capacity and drains water 60% faster than 100 mm slotted round pipe. Megaflo is an excellent drainage system, removing water from your structure faster than any other drainage system. The Megaflo system is manufactured as a corrugated panel supported by internal pillars along the length of the drain. This shape and structure gives Megaflo a high crush resistance whether the drainage system is used vertically or horizontally. Good road drainage is essential to maintain roads at optimal performance levels. The Megaflo drainage system is a cheaper alternative to French drains, which use scarce natural resources. 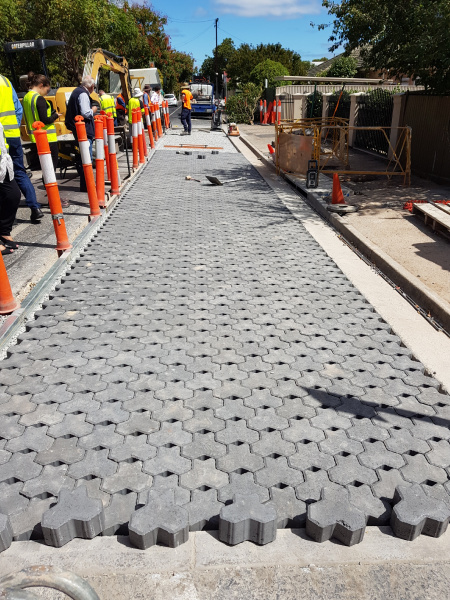 Megaflo halves the installation time required for traditional methods of road drainage making it ideal for projects with tight construction deadlines. The Megaflo drainage system requires only a narrow trench so installation costs are significantly reduced. Because of its stiff structure and high flow velocity there is also less risk of siltation. Megaflo is supported by our SuDDS software which allows users to design road edge and road pavement drainage systems using the Megaflo drainage system. The software allows for local soils and weather conditions and provides users with PDF design files and drawings as well as details of installation cost savings. 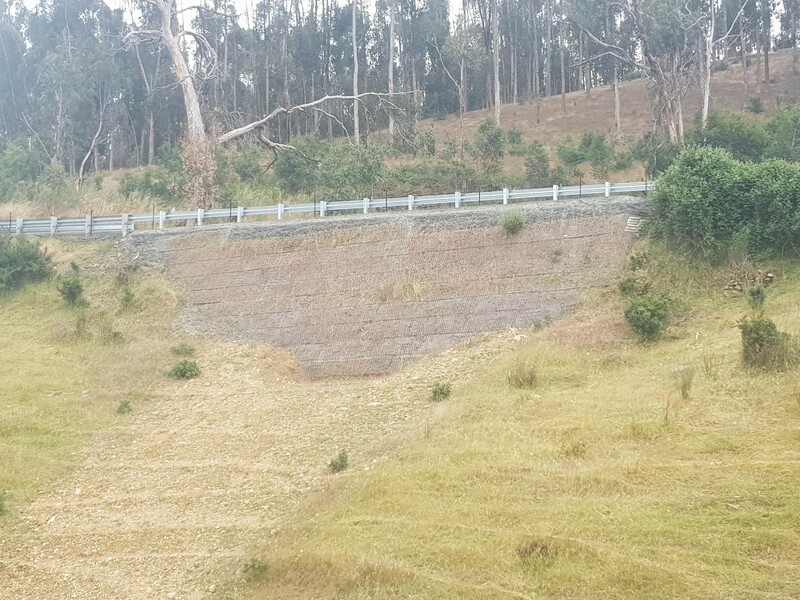 Megaflo is an accepted road edge drainage solution by AustRoads and regional road authorities. Megaflo is widely used in landfill drainage applications because of its high compressive strength under normal and inclined loads. It is resistant to leachates present in landfill operations and allows for safe gas and leachate drainage even under extreme loading pressures. Megaflo Ultra, is a very high strength Megaflo product, designed for use under exceessive loads, such as very deep tailings dams. Megaflo Ultra is supported by FEM modelling to prove it can withstand the applied loads. Removing surplus water from synthetic or natural turf sportsfields and golf courses quickly is important so play can resume as soon as possible. Using the narrow Megaflo drainage pipe allows the sports field surface to make a speedy recovery. 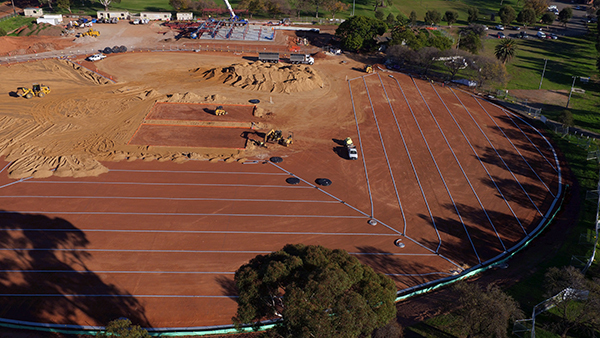 The Megaflo flat panel drainage system has been installed in sports fields all around the world, including world class stadiums, including FIFA World Cup, cricket, athletics and football stadia. Megaflo offers increased drainage performance when compared to conventional round pipe. The large surface area design of the Megaflo flat panel drainage system results in a water removal rate of almost twice that of a 100 mm round pipe. The increased drainage performance of Megaflo means that sports field surfaces are quickly returned to a playable condition even in wet weather. A distinct benefit of the Megaflo rigid flat panel drainage solution is its ease of installation. Its trenchless installation method means that once a surface has been prepared and leveled, the Megaflo panel drain can then be laid without disrupting the base level. With no trenches to dig, this means there is no need for gravel backfill and no disposal of trench spoils, resulting in a significant reduction in installation costs. Structures located below the water table may become unstable over time. Megaflo provides reliable drainage for construction projects like shotcrete walls and tunnels thanks to its open core and nonwoven geotextile wrap. Megaflo is ideal for use in landscaping applications such as behind non structural retaining walls, under driveways and paths, as well as being the most effective system on the market for drainage of lawns and turf. Megaflo is manufactured in Australia allowing full tracebility of every roll, while supporting local communities. It is narrow in width making it easy to install and is stiff in the vertical axis. Geofabrics can supply installation equipment to ensure for a safe and rapid installation process. Megaflo is supported by testing, design software, installation equipment and local stock holdings, as well as thousands of kilometres of installation over the past decade. The Megaflo system’s design simplifies the installation process, significantly reducing costs. Megaflo has a high crush resistance and an unmatched drainage response time. Megaflo complies with local road, rail and landfill specifications. Megaflo is supplied in rolls and is dispensed into the trench followed by the backfill which can be a well graded gravel or sand.